Dreams are the key which help us script the story of our life. HE has given us unlimited powers. We have all been created unique. How we script the journey of our life, which powers do we use, which of these powers go on to become our strengths and our passion, and how we convert our passion into a mission of our own life - is all in our hands. HE sent us here to fulfil that mission, and it will be a pity of we live our life small. We show you how and why to get going on your mission of life through a simple story "Dream On". We get set for the launch of this book in September this year. To keep yourself abreast of the latest developments around this, go ahead and 'Like' our Facebook page for Dream On. The first lever that you would need in your hand when you get set to script your life is freedom - freedom from the rut of earning money - aka Financial Freedom. 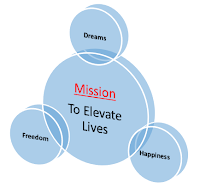 This freedom will let you chase your passion and try and discover your purpose of existence, else your time will be majorly consumed in generating money, and your life is very likely to end in regret and frustration. Freedom enables us to move in the direction of our dreams, but we must never forget that whatever happens in our lives, whether we achieve our dreams or not, Happiness is something that is inherent and guaranteed, as long as we learn to enjoy the journey rather than the result. The pursuit of a mission is self rewarding. We are full of love and happiness as long as we learn to prevent leakage of happiness to external objects, situations and people. We have an unlimited source of happiness inside us, and once understood and practised, this can enable us to experience what we term as "Happiness Unlimited" in the book by the same title, which was the 2nd book we launched in August 2014. You can visit the Happiness Portal for more details. There is nothing else which a fulfilled life would need if it can experience freedom, unlimited happiness and is in the pursuit of its mission. We feel grossly fulfilling today to have announced the launch date for "Dream On" and complete this circle of life comprising of Dreams.Freedom.Happiness, which will further help us in elevating lives all around us. Thank you each one of you, the readers, fans, supporters, friends, family, critics and every single person who gave us the wisdom to shape this journey, the way it is today.